Don’t resort to vegemite sandwiches or soup out of a can when you go camping with the family. Even if you have fussy eaters, these fun and easy camping recipes are sure to please even the pickiest palate! We trolled the internet and rounded up 15 camping recipes that are kid tested and approved. Plus, don’t overlook the fact that cooking during a camping holiday can be a great time for your children to learn about cooking and turn meals into fun camping activities for kids. So, trust us, stock up on the following supplies before you head out on your next camping holiday and enjoy some delicious meals and treats for the whole family. This camping recipe is sure to be a favourite! Plus, it’s an easy camping recipe for kids that they will likely request more than once. So stock up and feed your crew! 1. Heavily butter one side of each piece of bread. 2. Generously spread pizza sauce on one side of bread/biscuit/dough – to suit your taste. Then add shredded cheese and toppings, if used. 4. Trim off any excess ingredients when iron is closed. 5. Cook on the BBQ. 6. Open the irons and use a spatula to remove pizza. CAUTION! Jaffle irons will be very hot. AND, the insides of the just-cooked pizza will be very hot! Do not let young kids try to handle them until they have time to cool – which should only be a few minutes. Note: Olive oil or pan sprays can be used instead of butter/margarine. Imagine warm bread with some butter and jam … or perhaps even syrup on it. Perfect for breakfast at the camp or perhaps an evening treat! 1. Mix the flour, salt and sugar together into a bowl. 2. Rub the butter into the flour with your fingertips until it looks like fine breadcrumbs. 3. Add milk slowly and mix to form a soft dough. 4. Knead lightly on a floured board until smooth. Shape into a round loaf, brush with milk and cut a cross in the top surface of the dough. 5. Grease tin foil and dust with flour. Add bread dough and wrap it. 6. Place in the coals of the BBQ and let it bake for about 30 minutes. Note: To test if it’s done, tap on the loaf and it should sound hollow. Cut into moderately thick slices and serve while still warm. Top with butter, golden syrup or your favourite jam. Variations: You can add a variety of ingredients to damper for a different flavour. For example, add desiccated coconut, cinnamon, sultanas and extra sugar for a sweeter damper. Camping and frankfurts go hand in hand, but this twist on it makes it even better. The kids are sure to enjoy this easy camping recipe! 1. Sift flour into a bowl. Using fingertips, rub butter into flour until mixture resembles breadcrumbs. Make a well in the centre. Add buttermilk. Using a flat-bladed knife, stir until mixture forms a soft dough, adding more buttermilk if necessary. Turn out onto a lightly floured surface. Knead gently until smooth (don’t over-knead). 2. Divide dough into 6 equal portions. Roll 1 portion out to a 10cm x 16cm rectangle. Push 1 paddle pop stick into the end of each frankfurt. Place frankfurt in the centre of dough. Roll dough up to enclose frankfurt. Repeat with remaining dough, paddle pop sticks and frankfurts. 3. Place a large, greased cast iron pot over high heat until hot. Brush dough with egg. Carefully place in pot. Cover with lid. Reduce heat to low. Cook, turning occasionally for 15 minutes or until golden all over. Carefully remove from pot. Serve with tomato sauce. Yum! Who doesn’t enjoy some good nachos, especially after a long day of swimming or surfing at Byron Bay’s excellent beaches? 1. Utilising one of the Broken Head BBQs, place a layer of chips in the bottom of the cast iron pan, and top them with half of the: beans, olives, cheese, tomatoes, onion, salsa, corn, and jalapenos. 2. Place a second layer of chips on top of the other ingredients, and then top these chips with the remaining ingredients, finishing with the cheese on top. 3. Cover the top of the pan with a sheet of foil, and carefully place the pan on top of the grate or rocks. 4. Let nachos cook, maintaining the hot coals for 10-15 minutes or until the cheese is melted. Move the pan to a heatproof location and allow nachos to cool for a few minutes. Liberally coat foil and lightly cover pre-cut potatoes with non-stick spray. Place the food in the center of a large piece of foil, and sprinkle with seasoning of your choice. Close foil then roast the spuds in the BBQ or on a camp stove for 45 minutes. This easy camping recipe not only has a fun name, but also adds some fun to breakfast as kids cut open the bread. You can cook this on a BBQ hot plate. Butter the bread slices, both sides. Cut a hole in the middle of the bread that can accommodate a cracked egg, about 10cm. In a greased frypan, which is already hot and sizzling, place the bread. Put another knob of butter in the hole in the middle of the bread, and then crack 1 egg into the hole. Cook, until the bread, is golden on the bottom, and then CAREFULLY, using a wide spatula, flip egg/bread combo and brown the other side of the bread. Cook your eggs on each depending on how you like them. Season according to your taste. This super easy camping recipe doesn’t create a big mess of pans, but rather you can cook it wrapped up in tin foil. Who doesn’t love fewer dishes? This one can be done on the BBQ or if you brought a camp stove, then you can use a skillet and cook these individual dinners in it. Set each meal wrapped in foil right in the coals on the grill or in the skillet if you are using a camp stove. Cook for approximately 30 minutes. Let them set for 2-3 minutes after taking them off the coals to avoid steam burns. If you’re looking for camping food that is easy on the budget, check out this meal. It cooks up quickly to feed a hungry family after a busy day of being a tourist in Byron Bay. Note: While you’re cooking, you can decide to add more or less water depending on how thick you like your soup. 1. In a large pot, fry onion and garlic in a little olive oil for a minute until soft (if using). 2. Add tomatoes, beans (including liquid) and water/stock. 3. Add oregano, meat and veges (if using). 4. Stir over a medium heat until it reaches the boil. Then, add risoni and extra water if using. 5. Turn heat to low and simmer for about 10-15 minutes. 6. Add couscous if using, and allow to rest for 2 minutes before serving. What kid doesn’t love tacos? 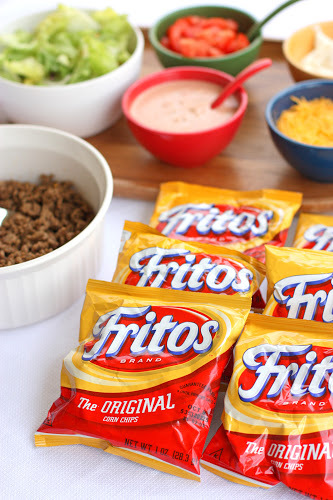 Plus, with this camping recipe for kids, they get to eat it out of a chip bag! You can prep some of this meal at home and bring it with you for an easy meal at the campsite. Or you can cook on the BBQ if that’s easier. Brown beef or turkey and drain the fat. Add the taco seasoning along with ½ cup of water and simmer until water is absorbed. If serving immediately pour in a bowl. Crush your chips with your hands and open your bag. Add whatever toppings you desire and eat with a fork as you walk around! This is a fun camping activity kids can help out with and it’s also good to eat! A small orange cake cooked to perfection. The flavour of the orange combined with the cake mixture is delicious. Grab an orange and cut the top off like a jack-o-lantern. Eat all innards of the orange with a spoon and then place some cake mix inside, up to about half way. Replace the lid and wrap the orange in foil. Place the package on a bed of coals in the BBQ for about 15 to 20 minutes. Unwrap, and enjoy! This easy camping recipe can be changed up based on what you have in your supplies. It also can be doctored up so it can be mild if the kids don’t like spice and add in the chili powder or flakes after you pull out their portions. It’s always nice to have options for camping food, so you can please the whole family’s taste buds. 1. Rehydrate peas in a bowl of hot water for a few minutes. 2. In a wok or if the BBQ has a hot plate you can use that, fry egg(s) in a little oil until scrambled and cooked. Set aside. 3. Fry onion and garlic in wok until soft. Add veges and stir well. Add meat if using. 4. Add rice and soy sauce and stir thoroughly. 5. Cook until there is no liquid in wok, then stir through egg. 6. Serve with chili if desired. For a good, hearty breakfast that fills up everyone before a fun-filled day of exploring Byron Bay, check out this easy camping recipe for kids. Bonus: You’ll love it too! 1. Heat up a medium size fry pan with butter or oil. 2. Add bacon and cook until it begins to crisps (5-6 minutes). 3. Add the mushrooms and stir for a further 5 minutes. 4. Drain the excess liquid from the pan and make sure the mushroom and bacon is evenly spread. 5. Pour the eggs carefully so that they fill in the gaps between the ingredients. 6. Add the tomatoes and spinach. 8. Cut slices of the Big Breakfast Omelette straight from the pan and enjoy. For this one, you might consider baking the potatoes at home before you leave to make your meal time even easier. 2. Between the cuts, stuff a slice of cheese, bacon and ham. Add small dabs of butter on top of each of the slices. Salt & pepper to taste. 3. Wrap potato in double layer of tin foil lightly sprayed with cooking spray. Place on a hot BBQ for 20+ minutes…until potato is hot and cheese, ham & bacon have melted together and it looks toasty and good! 4. Top the Potato Boat dinner with sour cream and green onion if you like. 5. The Potato Boat has so many possibilities … you could leave out the ham & bacon and just add cheese and broccoli, or chilli, or cooked taco meat. Mac and cheese is a favourite amongst most picky eaters so take it on the road with you for easy camping food during your holiday. Cook pasta according to directions. Once the pasta is done cooking, rinse it with cool water and drain well. Then stir in all of the ingredients and that’s basically it. You want to cool down your pasta so the cheese doesn’t melt. The last thing you want is a glob of cheese in the middle of your dish. Divide the mac and cheese in between mini aluminum pie tins. Top with more cheese. At this point, you can cover with aluminum foil and pack up for the cooler if you’re making it ahead of time. Once ready to cook, head over to the BBQ where you’ll want to make sure to place on the grill so the tins aren’t directly on your heat source. 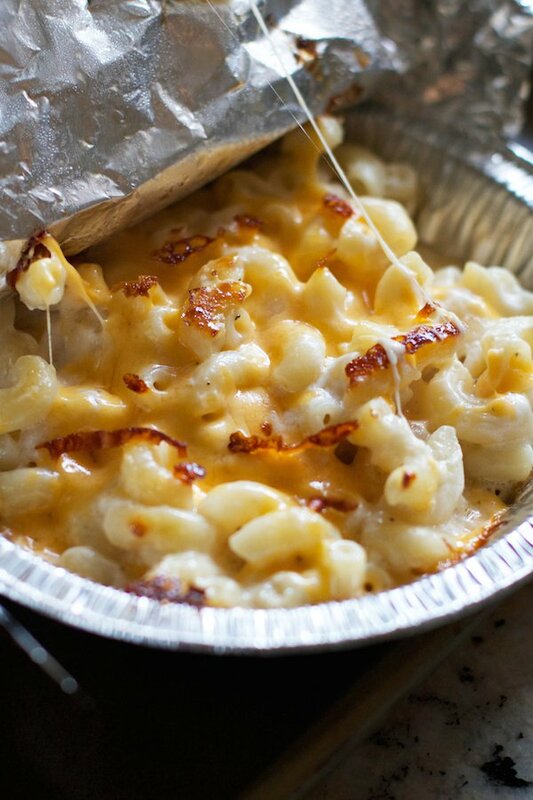 Heat up the mac and cheese for 8-10 minutes or until hot and cheesy. Let the kids join in to create this dessert! This easy camping recipe doubles as a great kids camping activity. Grab some bananas and get cooking. The directions are literally this: Slice the banana nearly in half lengthwise. Stuff it full of chocolate and marshmallows, wrap it in tinfoil and throw it in the fire. That’s it! Book a Holiday at Broken Head Holiday Park & Try These Camping Recipes! This spring, take the opportunity to go on a fun camping holiday with the whole family that will keeps costs down and still allow you to partake in the nearby attractions. 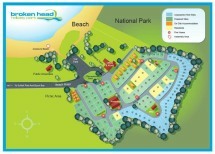 With close proximity to Bryon Bay and the surrounding shire, our Broken Head Holiday Park is a good choice for families on a budget.